Donna De Silva is an assistant professor in the Department of Nursing at Southern Utah University. Donna D completed her Masters of Science in Nursing (MSN) and Family Nurse Practitioner (FNP) at Western University of Health Sciences in Southern California. She is currently credentialed with the American Association of Nurse Practitioners (AANP). 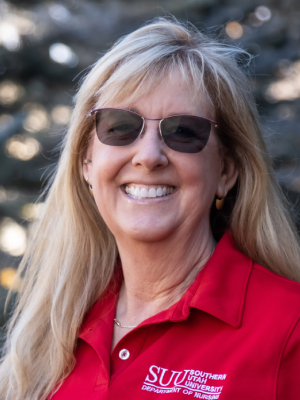 To stay current in her chosen profession, Donna D is a member of various organizations such as the Sigma Theta Tau International, Utah Nurses Association, Utah Nurse Practitioners, American Association of Nurse Practitioners, American Association of Critical Care Nurses, and the Utah chapter of the American Academy of Pediatrics. Donna D’s previous teaching experience has included both MSN and BSN programs for Azusa Pacific University and Loma Linda University, and she has taught pharmacology at Southwest Applied Technology College. Her nursing experience has been focused around pediatrics and she worked as a bedside nurse at Loma Linda University Medical Center. While at LLUMC she served on the committee for Palliative Care, was a Team Educator, served on the committee for, and researched the need for Patient Care Assistants in an ICU, was a data collector for the virtual PICU, and helped transition Loma Linda Children’s hospital into becoming a free-standing hospital. She also precepted new nurse employees, practicum students and new grad nurses. She has previously worked as a FNP in a clinic setting treating pediatric patients.